(Bangs wooden spoon for order) All right, settle down, this is serious business. Hey you...no giggling. Enough. Sorry. This both looks more difficult and more obscene than it actually is. Actually, no, I take part of that back, something about this whole process is definitely sort of obscene. But the results are obscenely good, especially if you are, like me, a fan of roast chicken skin. So, spatchcocking (knock it off!) 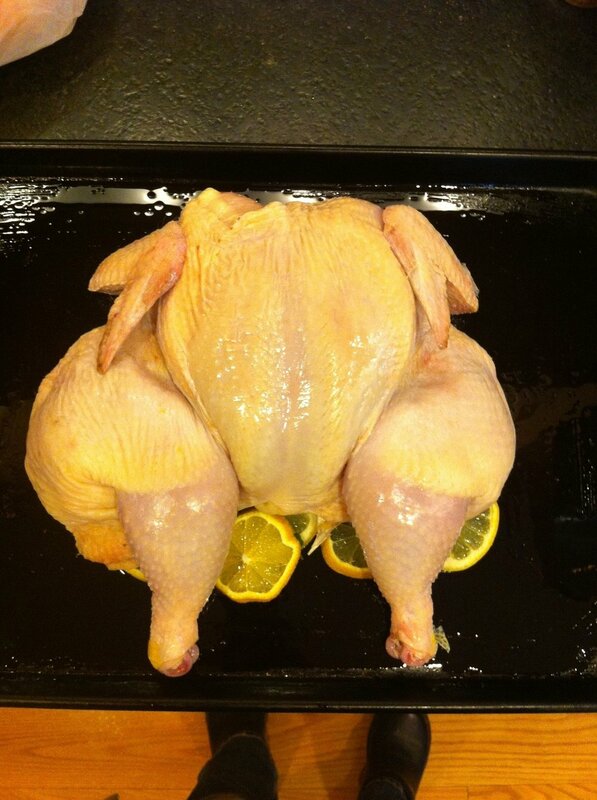 is simply removing the backbone from the chicken and flattening it out onto your baking sheet and roasting it thusly. Basically it's one step short of dismantling the whole chicken. I've seen it in magazine articles quite a few times, and Lucinda Scala Quinn features it in the January issue of Martha Stewart Living, roasted with lemons and shallots. I always trust Lucinda so I decided to give her recipe a try, and with two chickens so I would have a good foundation for the week ahead of going back to school. Preheat oven to 425. Brush 1 tablespoon oil on a baking sheet and place half the lemon slices and half the garlic cloves in single layer on top of oil, then scatter the herbs on top. Note: the cloves do not have to be peeled. Place chicken, breast side down, on a work surface. Starting at the thigh end, cut along one side of the backbone with kitchen shears. Courage. 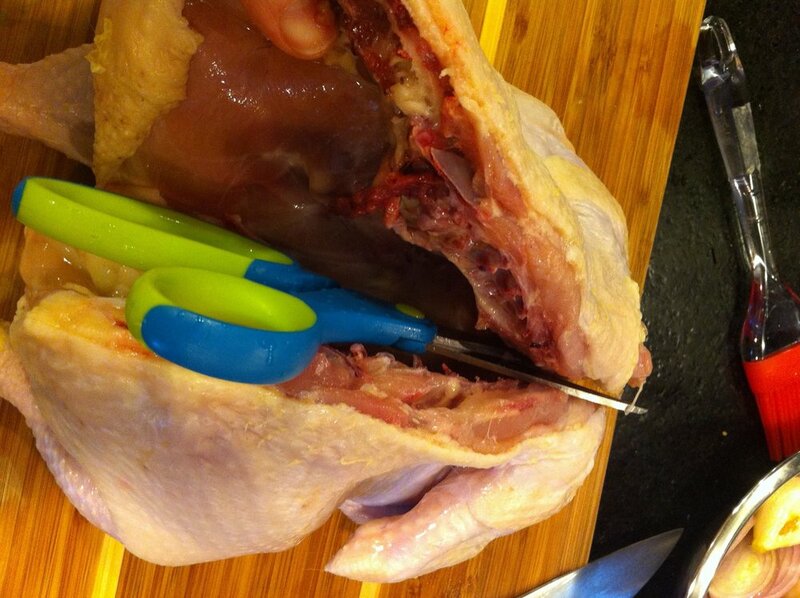 Turn the chicken around, cut along other side of backbone. Set backbone aside (more on this later). Flip chicken and open it like a book, pressing down firmly on the breastbone with the heel of your hand. Place chicken, skin side up, on top of lemons. Rub skin with remaining olive oil and sprinkle with salt and pepper. With your fingers or spatula, carefully loosen and separate the skin off the breast, and slide the remaining lemon slices underneath against the meat. You could slide some butter in there too. Why not. Roast chicken 20 minutes. Toss shallots and remaining (peeled or not) cloves of garlic with 1 tsp oil. After 20 minutes, scatter shallots and garlic around chicken. Roast another 25-30 minutes until a thermometer inserted in thickest part of breast reaches 165. Transfer chicken to carving board, let rest 10 minutes. Serve with the pan juices, roasted lemons, shallots, and garlic cloves (squeeze them out of the skins if you left them unpeeled). Now just take a minute and look at that skin. Look at it! Are you looking? That is chicken skin! Now, remember the backbones? Watch. Are you watching? Good. Throw them into your soup pot. Add 2 quarts water and turn the heat on medium-high. Peel 3 or 4 carrots, chop them any old how, throw them in. Add 3 or 4 ribs of celery. Throw in a couple onions, quartered. Leave the skins on because they will give the stock color, in fact if they are the last onions in the bag, shake all those loose skins in there. Got old garlic, those little center cloves that are so hard to peel so you chuck them back in the bin? Throw those in, don't peel them. Whatever sad vegetables there are in the bin, just throw them into the pot. Be sloppy. Add salt and pepper. Bring it to a boil and then turn it down low and forget about it for a few hours. Strain it through a fine sieve or cheesecloth, and discard all the solids. You are left with liquid gold, and tomorrow you can simmer it up with carrots, celery, barley, shred leftover chicken into it, and before digging in, drop in a slice or two of roasted lemon and one of those big, fat roasted garlic cloves.